that one could feel this peace and serenity, but it is the one place where I can stand at the very beach where the picture is take and just feel at one with the world, relaxed, calm and alive at the same time. I could sit there all day just enjoying the sounds and sites of the water and everything around it. I love strolling around Stanley Park and enjoying the different scenery as you move along the sea wall. Smelling the scents of the ocean, local plants and trees enjoying every moment of it. This is the reason I was inspired to do a collection this year on water and various ways it moves along this world. This way we can wear a piece of our summer fun and great memories while we endure a colder climate and dream of warmer days. 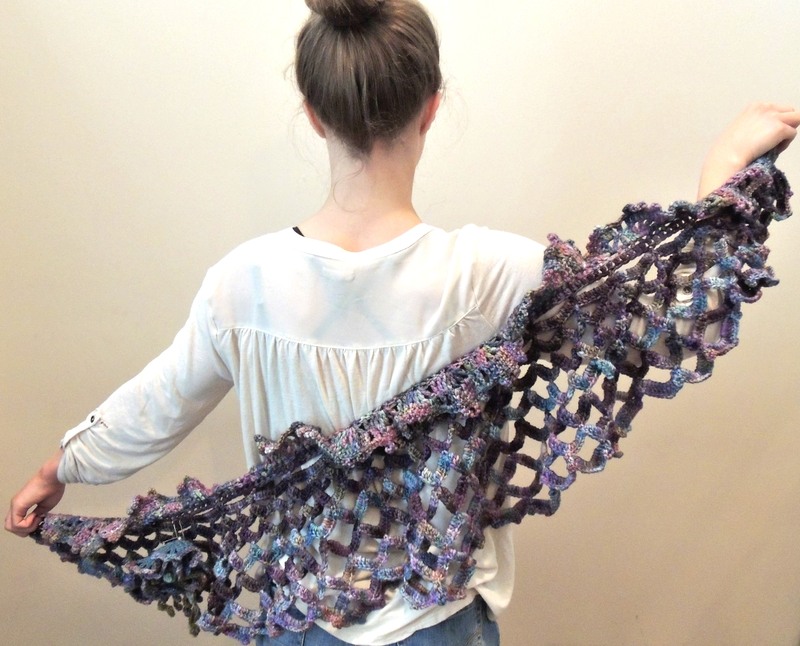 The Calming Waters shawl is inspired by the movement of water with the rippling water seen in the base of the scarf in two different hand painted yarns. 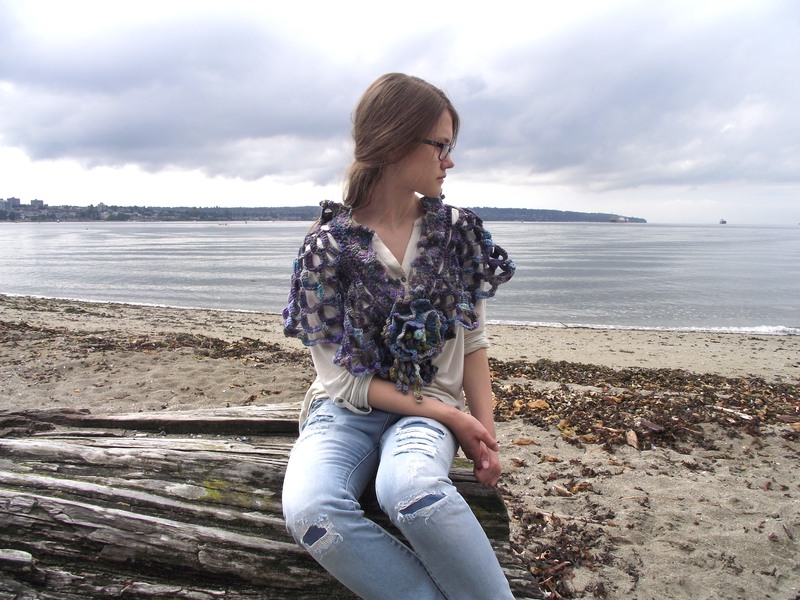 I used the Malabrigo Rios hand painted Merino Wool in two different colours to add the various colours you see on the ocean while the water is moving about. At the neckline the waves gently crash on to the beach (your neckline) and land softly around you reminding you of your favourite moments by the waters edge. 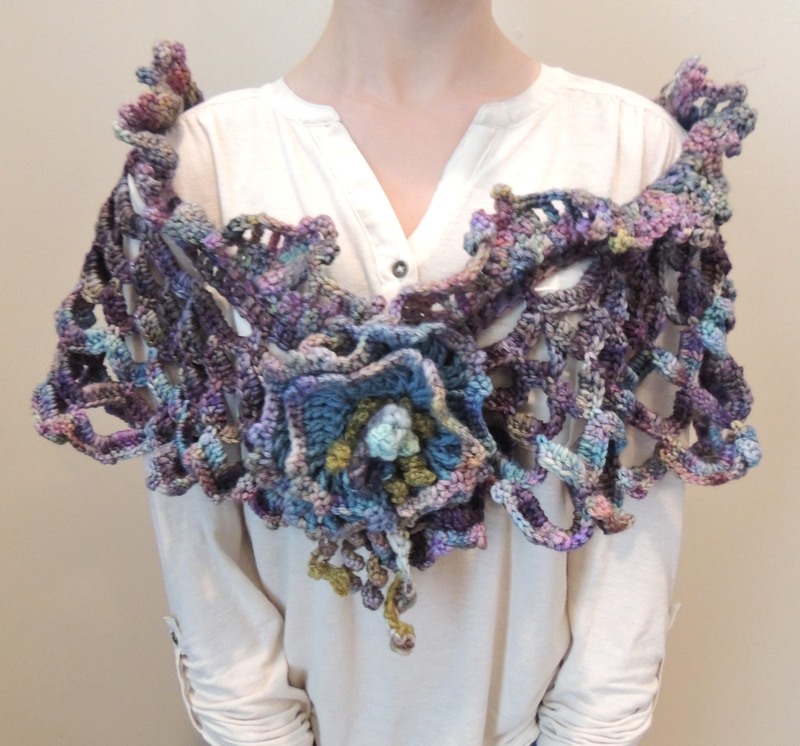 The embellished broche is a combination of waves and ocean plant life in merino wool, hand spun yarns, silk and cashmere of various yarns. I may add some other embellishments later, still thinking about it. 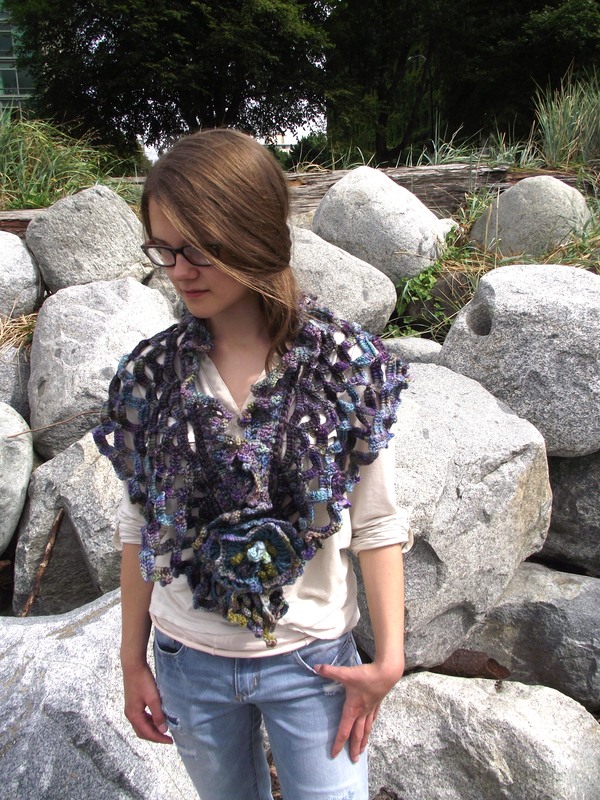 There will be two sizes of scarves with the same theme in the future as well as a waterfall scarf. Who knows what else I will design along the way. To see more of my Water Theme scarves visit my website and link to my etsy store at www.vbaberdesigns.com or go directly to my etsy store at www.intricateknits.etsy.com There are also a few past blogs on some of the current designs in my Ways of Water Collection. 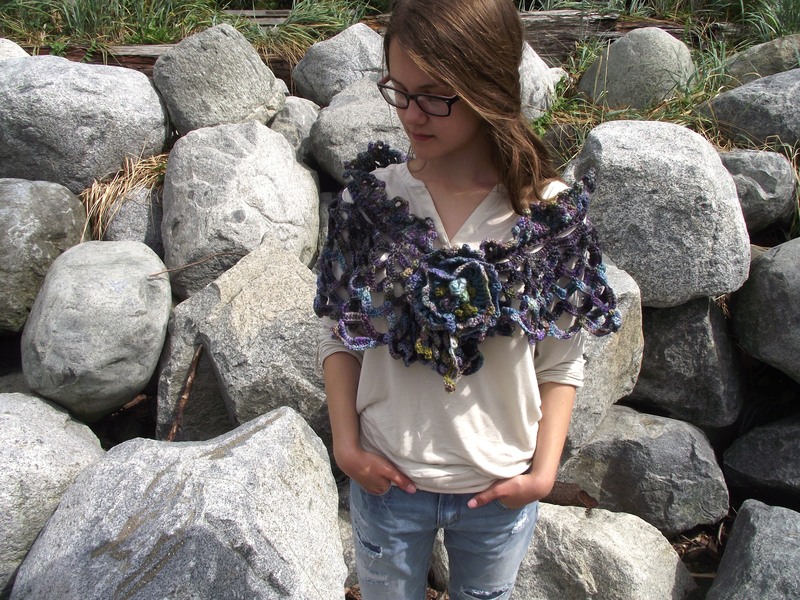 You can wear this shawl/shrug in many different ways as shown here. I will be adding more designs to this collection as I continue working on them with my inspiration of the water ways, or in this case the way of the water. Have a most wonderful day and don’t forget to be inspired by your surroundings and people around you. Beautiful colors. It is interesting to read about what inspires your work. The first picture really reflects the inspiration. Thanks Deb. I appreciate it. I love that it was overcast and really went well with the colours I chose. It was so wonderful being there. Just love it. That is crazy gorgeous! And you capture the elements and mood of the northwest beautifully!!!! Thank you very much. Coming from someone who spends a lot of time near the beach I am honoured with your compliments. 🙂 Just love it there!